The corneal transplant allows to surgically treat all corneal pathology that sound significantly on its transparency and visual function. Normal human cornea consists of several layers each having a specific role in corneal transparency and quality of vision. The area to the depth, the different layers are as follows: the epithelium, the outermost layer, the guarantor of the regularity of the surface of the cornea; Bowman’s membrane; stroma constitutes most of the total thickness of the cornea and contributes to its architecture; the endothelium layer of cells that do not reproduce and which function to pump water from the cornea in order to ensure full transparency. Any pathology in the anterior layers of the cornea create a more or less dense opacity, while the endothelium of disease will result in the occurrence of a diffuse or localized corneal edema. The procedure involves, with the help of modern ocular microsurgery techniques to remove the opaque or edematous cornea or in whole in the case of a transfixing graft or partially in the case of a lamellar graft, and replace by a human cornea from an eye bank. Every candidate for a corneal transplant is placed beforehand on a national waiting list to the Tunisian Transplant Establishment. The shortage of corneal tissue is a problem set to date and it is thus possible to have a graft in 1-2 months. While graft is pre-tested by the eye bank to ensure it is sufficiently rich in cells and it is not a carrier of a communicable disease known to date; in cases of doubt, the graft is destroyed and the transplant should be delayed by about one month. The synthetic corneal transplants are still a purely experimental alternative. The procedure is performed under local anesthesia by peri-ocular injections neighborhood, or general, and its average duration is about 30-45 minutes. It can optionally be associated with surgery a particularly troublesome cataract surgery an unbalanced Glaucoma drug plane or with an implant change. On average 16 stitches are placed 360 degrees around the graft to permit its healing. A protective shell is placed on the operated eye overnight and will, if necessary, replaced by a pair of glasses whose role is to protect the operated eye of a possible shock. Laser cutting of the cornea of the donor, the recipient but also replaces the classic textbook bit and allows you to make an accuracy of one micron (one thousandth of a millimeter) incisions in quality. It also allows the realization of cuts unthinkable in the horizontal plane in the manual procedure. The surgeon then acquires the second dimension for partial ablation (lamellar) of certain layers of this fabric without having to perform a replacement of its entire thickness. Femtosecond (10-15 s) is the very short time of order of each laser impact (spot). To get a sense of the brevity of this, and knowing that light travels around the Earth-moon distance in one second, it can travel only a hundredth of the thickness of a hair in a femtosecond! The brevity of these impacts enables maximum energy transfer without harmful thermal effect at the incision tissues. To carry out its cutting, the laser beam delivers a frequency of 200 kilohertz (200,000 spots per second), each spot is spaced a few microns along the cutting geometry defined by the surgeon. The cornea is a transparent tissue located in the anterior part of the eye. This is the “window” between us and allows us to see the outside world. His loss of transparency (burning, wound, infection or disease specific), but also the modification of its morphology (keratoconus), induce vision loss may frequently to blindness. Its partial or complete replacement is necessary to allow the patient to regain vision. 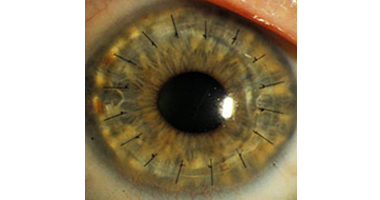 This is the corneal transplant or keratoplasty. The graft from a tissue bank and the patient’s cornea are then cut symmetrically with the laser and the transplant can take place. The graft is provisionally held in place until healing by suturing microphone provided inside same tissue. Laser cutting is performed using an anesthetic drops makes this perfectly painless.